The most important event in human history are all the events that surround the life, death and resurrection of Jesus Christ. IF these facts of history and what they mean are untrue we are of all people most to be pitied (1 Cor. 15:19). If untrue, Christians are fools (1 Cor. 15:17). BUT, if they are true, and they are TRUE, then every event surrounding the life, death, and resurrection of Jesus Christ changes everything about life and death. God planned from all eternity to reveal His glory in saving a people (sinners) for Himself and for His glory (Eph. 1:3-14; 2:1-10). He created all things good and for His glory. Sin, however, entered the world through disobedience (Gen. 3), and the results were (are) devastating and deadly because all people inherit and exhibit a sin nature (Ps. 51:5; Rom. 3:23). The wages of our sinful rebellion is death (Rom. 6:23). Sin left men dead, unable and unwilling to save themselves. Dead people cannot and do not make themselves alive. God chose to save a people for Himself (1 Pt. 1:13-21). Who are the people God saves? All the people who would repent and believe the good news (Mt. 1:21). In order to save His people from their sins (Mt. 1:21), God atoned for the sins of all people/sinners – past, present, and future – who would ever repent and believe the good news. He did this by offering up Jesus Christ in death so that we might receive His righteousness (Rom. 3:21-26). It’s the great exchange – He takes our sin, we receive His righteousness. After the Jesus died and was raised from the dead the gospel – the good news that Jesus paid our sin debt and conquered death – was and has been continually preached. Through the preaching of the gospel the Holy Spirit works in the hearts of the unbelieving so that they might experience the new birth (born again, Jn. 3:3) and respond by faith alone in Christ alone for salvation (Jn. 14:6; Acts 4:12). We are born again by the power and will of God, not by human power or good works; it’s all grace (Eph. 2:8-10). Sinners resist God’s offer off salvation. In fact, we are born resisting (Ps. 51:5). Dead people love their deadness, their sin. Yet, through the means of the preaching of the gospel, and our witnessing, praying, evangelism, and missions God overcomes the resistance of the sinner as people respond in faith to the good news (Rom. 10:9-13). Those who respond God keeps. No one can take us out of the hands of God (Jn. 6:39). We are secure in Jesus if we have truly placed our trust and confidence in Jesus, living for Him by faith. Finally, the gospel, in the end, gives sinners salvation, but, more importantly, it glorifies God. All things are for His glory. (Jn. 17:1-5). The gospel begins and ends with the glory of God. This Easter we celebrate the death of Jesus for our sins (1 Cor. 15:3). We remember His burial and subsequent resurrection from the dead (1 Cor. 15:4). Jesus’ death and resurrection and what it means for our salvation is the gospel. Have you believed the gospel? Turn from your sin and run to Jesus by faith, trusting Him and Him alone for the forgiveness of your sins. He will save you. We are right in the middle of 40 Days of Prayer Toward Church Revitalization at Inglewood Baptist Church. I have been moved and convicted by the guide we are using during this season of prayer. I have been asking myself some important questions: What would happen if I was truly spiritually revitalized? What would happen if true revival were to “break out” in and among God’s people? 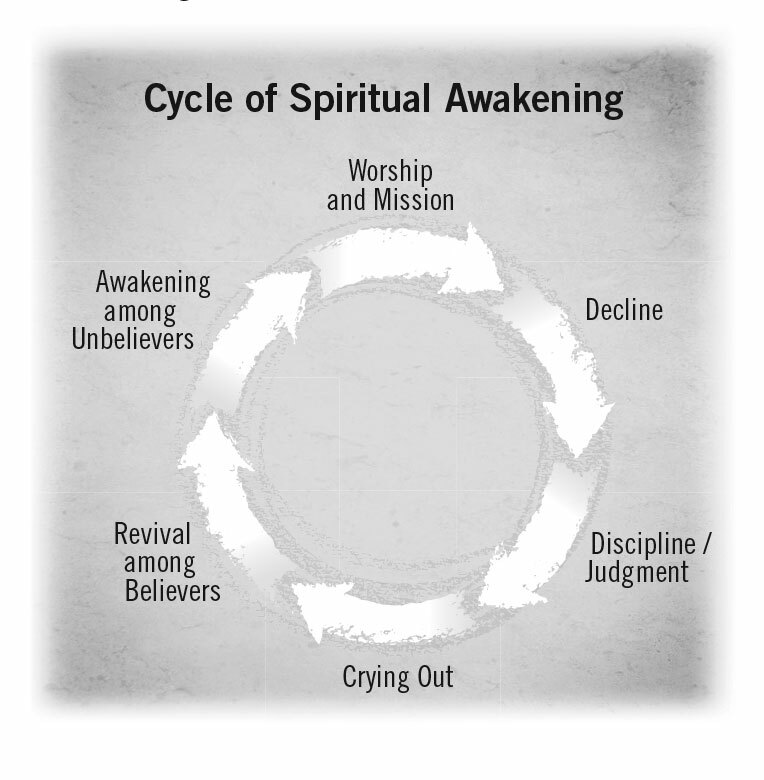 Scripture speaks to the “Cycle of Spiritual Awakening” in the Bible. Where are you in this cycle? Are you truly worshipping and serving God? Or, are you experiencing a sense of spiritual decline or even the judgment and convicting power of God? Are you crying out for God to do a new work in you and the church? Question: What should we do in order to see a fresh movement of the Holy Spirit? Return and do what you did when you were first saved and called by God. Dear brothers and sisters in Christ, let us turn back to God, pray for the Spirit to move in new and fresh ways, and unite for church-wide revival. And how will we know if we’re on our way to experiencing true revival and revitalization? Time – we’ll want to spend more time with Jesus, His Word, and His people. Talk – we’ll want to spend more time in prayer, speaking, and especially listening to God. Treasures – a renewed heart will swell in generous gratitude and willingness in the giving of our time, our talents, and our tithes in support of God’s kingdom work.